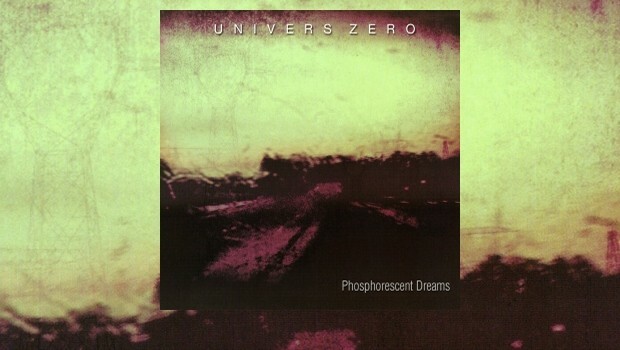 Thirty years ago with the release of Uzed, band leader Daniel Denis, by then the only remaining original member, took Univers Zéro in an entirely new direction. Spurred on by friendly competition with his good buddy and erstwhile bandmate Roger Trigaux and his new band Présent, Daniel forged a new dark electric ambience sinuously intertwined with the chamber orchestra dynamics already established that remained their template for many years. The shift in direction that Uzed represented is mirrored in Phosphorescent Dreams by a different and stripped-down line up and a heavier dynamic than that of 2010’s Clivages. With no bassoon or violin in sight, in addition to Denis, this new band retains Kurt Budé (reeds) and Dimitri Evers (bass) from the last album, and adds spiky electricity in the form of Nicolas Dechêne (guitars) and Antoine Guenet (keyboards). However, this new line up remains resolutely Univers Zéro, and opening track Shaking Hats displays all the chamber rock menace we know so well, marching to a developing militaristic theme that shifts like quicksand allowing for intricate interplay and subtle layers of atmospherics. The flute-like tones of Nicolas Dechêne’s guitar bring the piece to what transpires to be a false conclusion, and we play out to eerie soundscapes created by Kurt Budé’s clarinet and Antoine Guenet’s keyboard. All in all a confident start to the album, Shaking Hats was written by Daniel Denis, as are tracks three, five and seven, alternating with the even-numbered tracks written by Kurt Budé. The first of these is the filmic Vocation, where swirling mists part to reveal a dark heart and some searing guitar from Nicolas. Denis’ Trés Affables morphs into a VdGG-like structure moulded into UZ’s very own, and it includes some scintillating piano from the other new boy Antoine, who for his relatively young age already has an impressive CV having appeared on many crucial albums in the last four or so years. Hypnotic and suitably so, Rêve Mécanique marries the reflective sound of Kurt’s clarinet to the sparking electric menace offered by Antoine and Nicolas to great effect. A sinuous journey into the heat of the machine, Rêve Mécanique never loosens its grip on your imagination for one second of its more than justified twelve and a half minute duration. The central theme, initially played out on clarinet is later reflected on piano and slowly climbs in tension. It has taken me a while to get into this album, which may be surprising as it is by no means as difficult as some of this band’s more fearsome works. However, once lodged in the psyche it is difficult to turn off. That is the sign of a good album; no instant gratification, but a subtle and deepening symbiotic relationship with listener developing over time. The hypnotic nature of the themes on this record continue, with the stealthy Les Voleurs d’Ombre as Kurt blows hard in a mid section that anchors his free jazz instincts to an insistent rhythm plucked out by Nicolas. More traditionally “UZ” than any other tune on the record, fans will be charmed by its macabre sonics as it marches off into the night with your shadow in its grip, careening through a dark corner of night terror. If nothing else, L’Espoir Perdu (The Lost Hope) is at least typical UZ in title. The music is a chamber of reeds, and all very cinematic film noir, taken at a needed slower pace after the arrhythmic charge of Les Voleurs d’Ombre. This leads into the concluding title track, another piece well over twelve minutes in length. Commencing in an atonal and jarring fashion the shards of ultra-bright light of these Phosphorescent Dreams are hard to see beyond, but being a brave soldier, I will squint at the reflected luminescence and attempt to get under its steely glare. For some minutes the tune burns in this fashion until it eventually turns down the intensity, finally slowing to some bottom end notes from Antoine’s piano and Dimitri Ever’s bass. The tune climbs back up as Nicholas joins in with some piercing notes filling in the gaps. A new UZ classic, and a tune that must be great to see and hear played live. The new line up has injected fresh energy into this wonderfully wilful troupe, and Phosphorescent Dreams is another album that will certainly feature in my “Best Of” list at the end of the year. This album is highly recommended for fans of UZ and RIO in general, and is as good a place as any for the uninitiated to start. It is a shame that this fine album does not appear to have any European distribution. Released on Japanese prog label Arcangelo, whose website is only in the native language renders a link on this page not particularly useful. I have managed to find the album on Wayside Music, that purveyor of fine sounds from the USA, but the album is $30 before you even add in the no doubt extortionate UPS charges. Licensing issues aside, someone in Europe should take this on board now, as it would be a criminal shame if it disappeared without trace as it seems to be in danger of doing.